(Phys.org) —Researchers at Rice University have come up with a new way to boost the efficiency of the ubiquitous lithium ion (LI) battery by employing ribbons of graphene that start as carbon nanotubes. 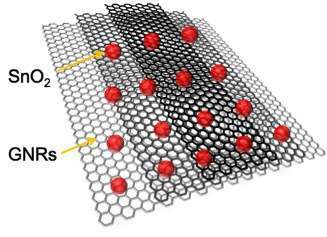 Proof-of-concept anodes—the part of the battery that stores lithium ions—built with graphene nanoribbons (GNRs) and tin oxide showed an initial capacity better than the theoretical capacity of tin oxide alone, according to Rice chemist James Tour. After 50 charge-discharge cycles, the test units retained a capacity that was still more than double that of the graphite currently used for LI battery anodes. The research appeared this week in the American Chemical Society journal ACS Nano. 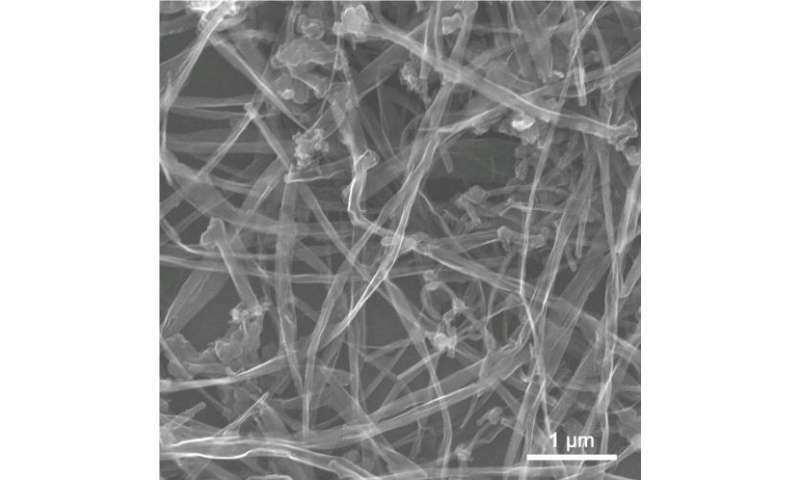 Tour and his colleagues developed a method for unzipping nanotubes into GNRs, revealed in a 2009 cover story in Nature. Since then, the researchers have figured out how to make graphene nanoribbons in bulk and are moving toward commercial applications. One area ripe for improvement is the humble battery. In an increasingly mobile world, battery capacity is becoming a bottleneck that generally limits devices to less than a day's worth of use. Lab tests showed initial charge capacities of more than 1,520 milliamp hours per gram (mAh/g). Over repeated charge-discharge cycles, the material settled into a solid 825 mAh/g. "It took about two months to go through 50 cycles," said lead author Jian Lin, a postdoctoral researcher at Rice, who believes it could handle many more without losing significant capacity. GNRs could also help overcome a prime difficulty with LI battery development. Lithium ions tend to expand the material they inhabit, and the material contracts when they're pulled away. Over time, materials like silicon, which shows extraordinary capacity for lithium, break down and lose their ability to store ions. Other labs at Rice have made breakthroughs that help solve the expansion problem by breaking treated silicon into a powder, achieving great capacity and many cycles. GNRs take a different approach by giving batteries a degree of flexibility, Tour said. "Graphene nanoribbons make a terrific framework that keeps the tin oxide nanoparticles dispersed and keeps them from fragmenting during cycling," he said. 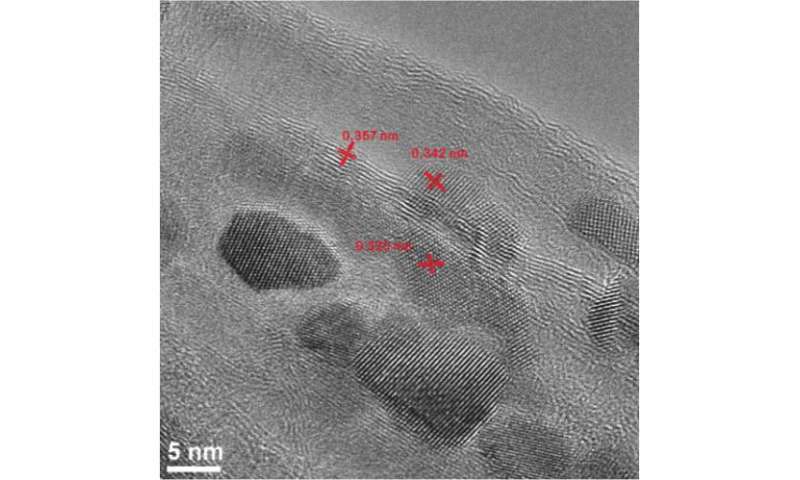 "Since the tin oxide particles are only a few nanometers in size and permitted to remain that way by being dispersed on GNR surfaces, the volume changes in the nanoparticles are not dramatic. GNRs also provide a lightweight, conductive framework, with their high aspect ratios and extreme thinness." The researchers pointed out the work is a "starting point for exploring the composites made from GNRs and other transition metal oxides for lithium storage applications." Lin said the lab plans to build batteries with other metallic nanoparticles to test their cycling and storage capacities. The development in batteries seems to mirror that in hard drives/floppy discs over the past 30 years. First you had 'brown soup', which was basically a suspension with magnetized particles which you tried to spread as evenly as possible on a platter. But in effect it was still a very unordered 'splat'-kind of process. As data densities increased more and more effort was put into applying the magnetic particles in an ordered manner. Once someone tries to go for fully structured anodes/cathodes (either via structured/patterning manufacture or self assembly) battery capacities will likely make another, major jump.